Arguably this already happens if we combine Performance Table/ RAISEOnline with OfSTED reports. 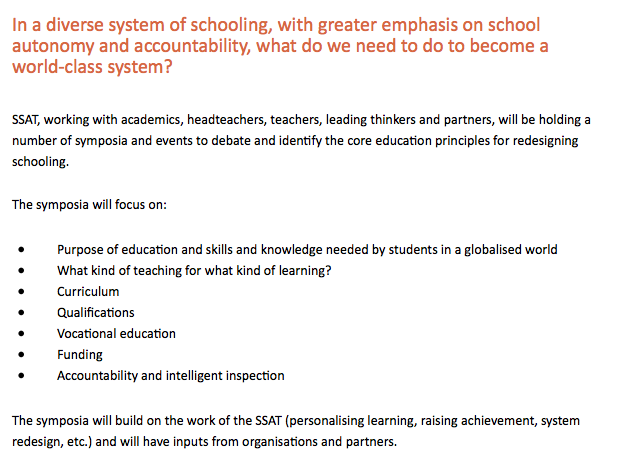 Schools can use self-evaluation processes and reports to put forward their own case for how effective the school is. However the issue of OfSTED judgements being so narrowly determined by a few data outcomes is a legitimate area of concern; schools can be ‘NTI’ based on data, regardless of how an inspection progresses. The ‘three level progress’ measure, if unpicked, is one giant error-bar measured against another – and yet schools can be cut to ribbons by it. So, here, I feel the issue needs to be expressed more clearly with a rigorous set of alternatives put forward. I’m not sure about this at all. I don’t think a local partnership is necessarily more likely to support a process that delivers school improvement and accountability. The issue with OfSTED is that it creates a climate of fear that suppresses rather than breeds self-confidence in teachers and leaders. Would a local system manage to be different – but also rigorous? Who knows. I don’t think we’ve reached a point yet where there is a strong enough culture among schools to provide mutual challenge as well as mutual support for the DfE to sanction the devolution of OfSTED’s powers. We’re often so defensive that we can’t have an honest conversation about the reality of some schools, some Heads and some teachers being below standard… I think we need to show more steel in this area before local accountability would have the credibility needed. Defining ‘local’ is also hugely problematic and you can be sure that some local partnerships would be much much more effective than others. I also feel that localism of this kind is incompatible with the desire for a system of national pay and conditions; it gets messy to pick and choose. I like this idea. I doesn’t make sense to say ‘take education out of political control’ because that negates our democratic instincts to want to influence the nature of our education system; it is hard to think of a more important political imperative. However, to toss our assessment system and curriculum around every 5 years is ludicrous. A level of independence as suggested here would be a very good thing indeed. However, we need to argue like hell about what it starts off with – because 20 years is a very long time to live with a system that doesn’t meet the needs of our young people or the nation as a whole. My contact with this issue has been limited to two particular cases but it seems evident that the current system of ‘academisation’ breaks down where a school begins to falter and no-one really wants to own the problem. A local solution may well be better provided that there is sufficient funding. However, I don’t believe that is necessarily inherently true. National chains are really in their infancy and it is hard to know what impact they will have long term. It is fair to say that they are not performing miracles but then neither do LAs. At the same time, I know that local competitive behaviours are deeply ingrained in some areas and that is not compatible with the ‘family’ ideal. Personally, I think this issue has the potential to be divisive and could derail the other points in the Heads’ Roundtable if they all need to be subscribed to. I agree with the spirit of this although there needs to be greater clarity about the nature of assessment and the role of statistics in setting standards. Designing a series of exams that are consistent in the standards they set is a specialist area requiring some expertise. Norm referencing has a role in defining initial standards and in examining patterns over time; it has been used for decades. However, it is unacceptable to adopt the practice of fixing standards year on year by norm referencing such that there is no possibility for overall improvement in the system and a cap on any individual’s achievement. What we need here is both a case to be made for a specific alternative system but also for laypeople to keep their noses out/hands off! Politicians (definitely) and even an average Head or teacher is not qualified to set grade boundaries or design assessments that can be compared fairly between centres, and across years. How do you define absolute standards in English, Maths, French or Geography? In different ways! This is expert territory… we need to respect that and reflect it in everything we say. 6) School accountability measures should encourage collaboration between schools and explicitly develop systems leadership. I agree with this entirely. A school cannot be truly outstanding if it acting alone, separate from the system of which it is a part. This links into point Number 1. However, the nature of collaboration should be allowed to be wide-open. Some collaborations operate at a national level with common-interest schools and some are more local. All schools should be obliged to contribute to the training of new teachers and aspiring leaders. Where national chains lead to schools being isolated at a local level, (all too common) there is tension and this needs to be resolved. However I’m not sure who is responsible for that resolution! 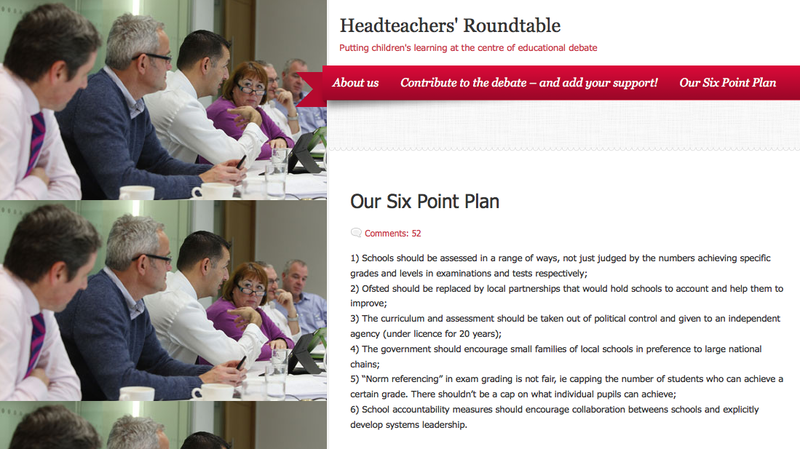 So… if nothing else the Headteachers’ Roundtable has catalysed a lot of thinking. I’ll return to my call at the start for the group to engage fully with the SSAT Redesigning Schooling process; if they do then I think we’ll get a set of ideas that have an excellent chance of coming to life. I’m sorry Tom, I feel your response to 5) “Norm referencing” is a bit wishy-washy. I don’t think the argument is as complex as you suggest. We must choose between the Olympics model in which a number succeed – in the Olympics’ case the number is 1, and the Driving Test model – anyone who can demonstrate an appropriate level of competence succeeds. The latter model, ‘criterion-based’ is in my view both rational and moral for the purpose of individual fulfilment, assessment of schools’ performance, school leaving and future career selection. If it does not select a small enough proportion at the highest level, you simply add further criterion-based higher grades, hence the introduction of the A* grade. Thus with more young people experiencing a better education, we may need the A** grade now to help the selection process for university or jobs, but we don’t need to limit numbers who succeed at existing grades. There is no expertise in realising that we must rigorously defend and sustain comparability of the criteria which indicate the grade and equally there is no expertise in realising that a lot of children have been mistreated. Badly done, OFQUAL, badly done! Hi Richard. Thanks for the comment. It is only wishy-washy because I don’t have space for the detail here. If you’ve ever set two tests that are meant to measure a similar standard, you need to consider how this is done. Try setting two English papers and decide if one was harder or easier than the other… it is a question that must be faced. We do this with our entrance test every year. It is legitimate to factor in a cohort performance element to determine whether the standards are similar. However, once established with a sample, it should be possible for any number of students to achieve the standards. My feeling is that many people don’t fully appreciate the mechanics of how exams run and have always run and, therefore, it is not sensible to make this a simplistic call. We need a better argument along the lines that, once set, there should be no limit to the number of candidates who can achieve a given grade.